The InSight space probe touched down safely on the Elysium Planitia plains of Mars on 26 November 2018 at 20:52:59 CET. Carrying the DLR experiment HP3 (Heat Flow and Physical Properties Package), the mission will yield fresh insights into how the interior of Mars and rocky planets like Earth are structured and how they have evolved over time. COLOGNE, Germany (DLR PR) — Just a few weeks from now, the German Aerospace Center (Deutsches Zentrum für Luft- und Raumfahrt; DLR) HP3 Mole will start hammering its way automatically into the subsoil of the Red Planet to measure its inner heat. The HP3 experiment landed on Mars with NASA’s InSight space probe on 26 November 2018 at 20:52:59 Central European Time. The geophysical observatory travelled almost 500 million kilometres before settling gently on the Elysium Planitia plains just north of the Martian equator. “We are delighted that a DLR experiment is now present on Mars for the first time and that we can make a significant contribution to this hitherto unparalleled exploration of the Red Planet’s interior, which is certain to go down in aerospace history,” says Hansjörg Dittus, DLR Executive Board Member for Space Research and Technology after observing the landing from Pasadena, California. Thomas Jarzombek, German Federal Government Coordinator for Aerospace, is also extremely pleased: “I congratulate the project managers on the successful landing on Mars. The InSight mission demonstrates the achievements of international cooperation in space research. Germany has made a key contribution to the HP3 experiment, which is proof of DLR’s outstanding and internationally recognised expertise. The InSight mission was launched from Vandenberg in California on 5 May 2018. Hurtling into the Martian atmosphere at a speed of 19,800 kilometres per hour, it was slowed down to a landing velocity of just eight kilometres per hour in less than seven minutes. Its three legs finally came to rest on Martian soil at 20:52:59 CET. Once InSight has delivered the first images of the area around the landing site, the next step will be to produce a 3D model of the surface. Researchers will then use this model to decide where – within a radius of one-and-a-half metres – the robot arm should deposit the Mars mole HP3. This will take place in early January. Release of the Mars seismometer SEIS (Seismic Experiment for Interior Structure) is already scheduled for December. DLR is also involved in this experiment, which was built by an international consortium led by the French space agency CNES. “An ideal location for our Mars mole would be one that is as sandy as possible and does not contain any rocks,” says HP3 operations manager Christian Krause from the DLR Microgravity User Support Center (MUSC), who will teleoperate the Mole together with his colleagues, initially in the control room at the Jet Propulsion Laboratory (JPL) in California and later at the control centre in Cologne. 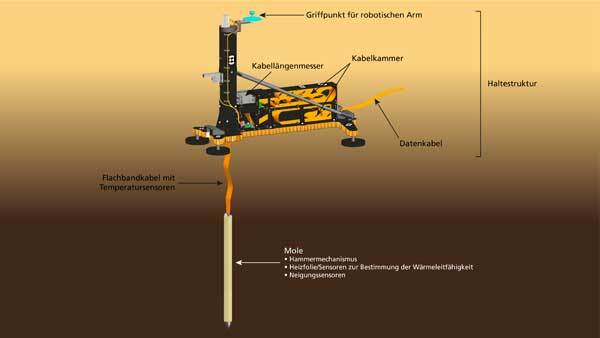 The Mole will burrow its way in small increments to a depth of up to five metres, dragging a tether equipped with highly accurate temperature sensors. The Mole will take a break every 50 centimetres to measure the thermal conductivity of the Martian soil. In total, the temperature sensors should deliver data on the temperature gradient in the subsoil for two years. Scientists will then use this data and the thermal conductivity to calculate how much heat the interior of Mars is still emitting today. At present, researchers only have imprecise knowledge of how Mars is structured into a core, mantle and crust, their individual properties and why the dynamism of its inner development diminished so quickly compared to Earth. The InSight mission is being conducted by the Jet Propulsion Laboratory (JPL) in Pasadena, California, on behalf of NASA’s Science Mission Directorate. InSight is a mission in the NASA Discovery Program. DLR is contributing the HP3 experiment to the mission. Scientific leadership lies with the DLR Institute of Planetary Research, which was also in charge of developing the experiment in collaboration with the DLR institutes of Space Systems, Optical Sensor Systems, Space Operations and Astronaut Training, Composite Structures and Adaptive Systems, System Dynamics and Control, as well as the Institute of Robotics and Mechatronics. Industrial partners are Astronika and the CBK Space Research Centre, Magson GmbH and Sonaca SA. The scientific partners are the ÖAW Space Research Institute in the Austrian Academy of Sciences and the University of Kaiserslautern. The DLR Microgravity User Support Center (MUSC) in Cologne is responsible for HP3 operations. In addition, the DLR Space Administration, with funding from the Federal Ministry for Economic Affairs and Energy, supported a contribution of the Max Planck Institute for Solar System Research to the French main instrument. Detailed information on InSight and the HP3 experiment are available on DLR’s dedicated mission site: www.dlr.de/en/insight. For mission updates follow @NASAInSight on Twitter.